do you know what winter is really all about? You are invited to embrace all the restorative and inspiring aspects of winter this year. If you are anything like me, this has been a BIG challenge in the past, but now, Im open to soak up the fortifying practises and soak in all the warm baths that winter offers. Personally : with winter specific [60 min] vinyasa + [30 min] restorative video practises + simple rituals to create your retreat space at home and internally, in your body-mind-heart home. Privately : this sadhana includes a 1 on 1 session with me where we can focus on customised yoga sequencing, Ayurvedic diet + lifestyle or a bit of both. This can be done in person or via skype. Collectively : I will be sharing bi-weekly writing exercises to help you get deliciously clear on your deepest desires and what needs to go in order for them to bloom + seasonal recipes, inspirational resources, ayurvedic therapies and more. You can also share your insights, ponderings and wisdom vis our private facebook group. winter done right can be incredibly fortifying, we are primed for insight and fertile with intentions, it's the time to get wild with self love and radical with nurturing acceptance of ourselves! are you ready to embrace a deep, dark and wild winter? marks the darkest point of the year and the gradual re-emergence of light. 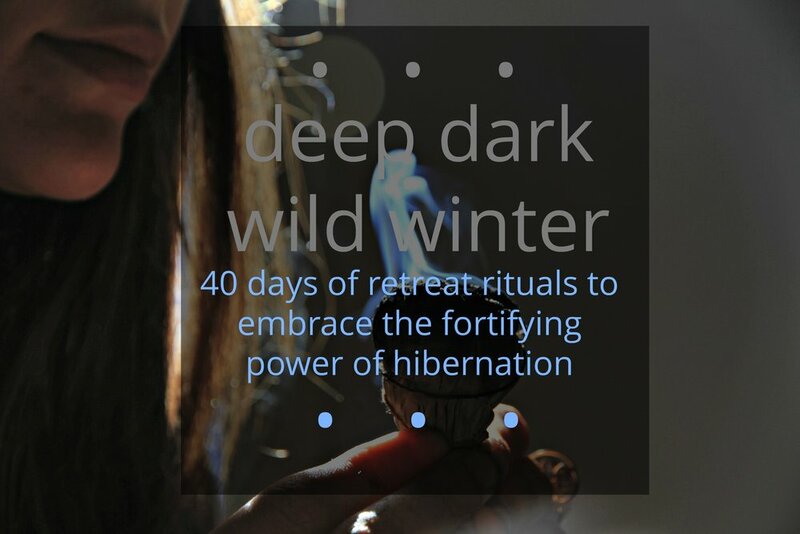 Winter is a natural time to retreat and honour the pull of hibernation. During this 40 day sadhana we will purposefully pause and regenerate, like we see occurring in all of nature. Over the next 40 days we will explore the depths of our body, mind and heart with transformative yoga, meditation and life practices to wildly embrace our whole selves. Winter is the ideal time to nourish the inner fire, build stamina and heal as we awaken and emerge into the warmth and light of spring. At this time of year it's common to experience poor digestion and circulation, sluggish metabolism, depression, lethargy, dullness and often the immune system takes a beating. When practised regularly, we can experience balance and harmony with the inner and outer environments, keeping our pitta (fire) alight and vital.